Vei Lou Queri in the Creuse - Itinerary to "Veï Lou Quéri"
Home > Exploratory maps > Itinerary to "Veï Lou Quéri" and "Chez Mémé Delphine"
La Châtre is not always mentioned on the signs. After about 21 kms after La Châtre, + 3 kms after the sign “bienvenue en Creuse”, in the hamlet of Les Betoul(l)es, you turn right to Moutier-Malcard. The sign (Moutier-Mld) is only visible at the last moment, so drive slowly. 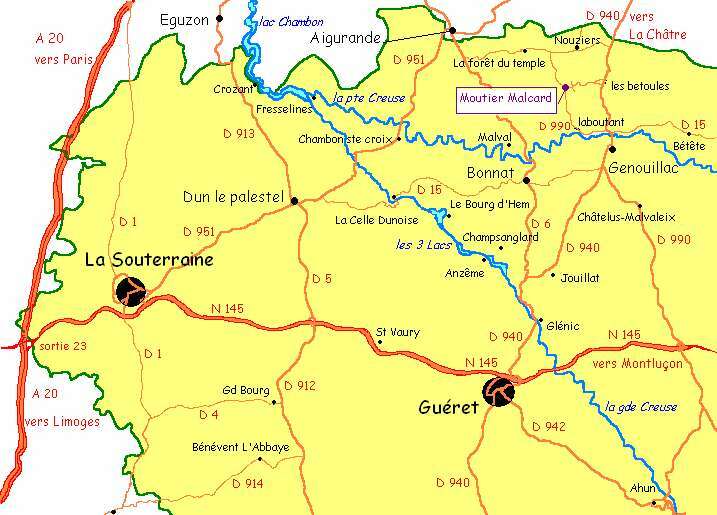 You will see the small green signs “chambres d’hôtes (at Moutier-Malcard)” that will guide you all the way. In Moutier-Malcard on the crossing (opposite the shop), you turn right and again the second to the right,on the small road to Le Geay (or Le Geai). Soon after you will see on the right hand side our house with red shutters, where you are most welcome. You can park in the court yard. The gate is just after the house. Depending on the traffic and your speed, from Paris it will take you about 2 hours to Châteauroux and about 1 hour from there to our house. Hint: It’s always very crowded around Paris, but if you go through at lunch time (from 12.00 till 14.00 o’clock) it’s the least annoying (“la France est à la table" - France is having lunch!). Bonne route/have a good trip. Home < Exploratory maps< Itinerary to "Veï Lou Quéri"and "Chez Mémé Delphine"